Processed wavy/curly hair (not natural wavy/curly). Processed from 100% natural hair (full cuticle, no treatment with chemical, not dyed, not bleached). Quality of weft: thin weft, no shedding. Color: natural dark (#1, #1B, #2). 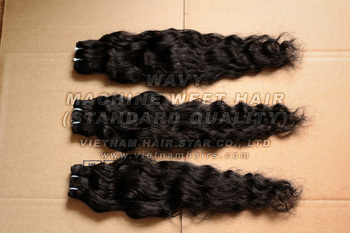 Keywords: human hair, vietnamese hair, vietnam hair, natural hair, remy hair, weft hair, machine weft hair, wavy weft hair, curly weft hair, single drawn hair.